2000 Giltinan champion John Harris (Rag & Famish Hotel) now shares the lead with Hugh Stodart’s Asko Appliances after taking out the resail of Heat 1 of the Ssangyong JJ Giltinan Championship on Sydney Harbour today (Monday, 21 February). Harris, with crew Chris Cleary and Craig Ferris, won the start and were never headed over the easterly course as they took victory by 41 seconds from Asko Appliances. Another former Giltinan champion, Trevor Barnabas replaced an injured Sean Langman as skipper of AAPT and showed he had lost no skills in retirement when AAPT came home in third place. After the two heats sailed to date Rag & Famish and Asko are on four points, followed by Heat 2 winner Computer Associates (Anthony Young) on eight, and Maytag (Tony Hannan) 12. Defending champion Rob Greenhalgh (RMW Marine) suffered from another poor start to finish eighth today and be placed fifth overall on 14 points. Euan McNicol’s Club Marine and Micah Lane’s Belle Property both sailed excellent tactical races to finish 5th and 6th respectively. 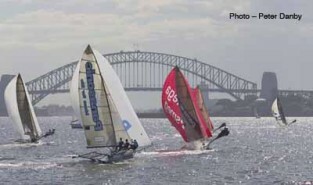 Australian champion Michael Coxon (Casio Seapathfinder) and his crew were again very disappointing. They were another team to get a poor start and never recovered to finish in 11th place – some three and a half minutes from the winner. Heat 3 of the championship will be sailed tomorrow (Tuesday, 22 February).